Blacks Design is an antiques and art gallery shop based in Brackley, Northamptonshire. We are open from Tuesday to Saturday 10am - 5pm. Sunday's by appointment only. Run by Rob Black, an antiques dealer for over 30 years and his wife Annabel Black, an interior designer and artist. 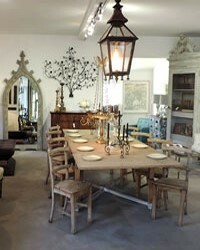 Together we bring a combination of decorative, eclectic and iconic antiques and furniture. We also have a bespoke modern range of furniture designed by us that can be adapted to suit your needs. One part of the shop is a dedicated art gallery, where contemporary artists are invited to exhibit at quarterly exhibitions. Please see our website for details. BLACKS DESIGN to provide own terms and conditions. Consumer Contract Regulations apply.